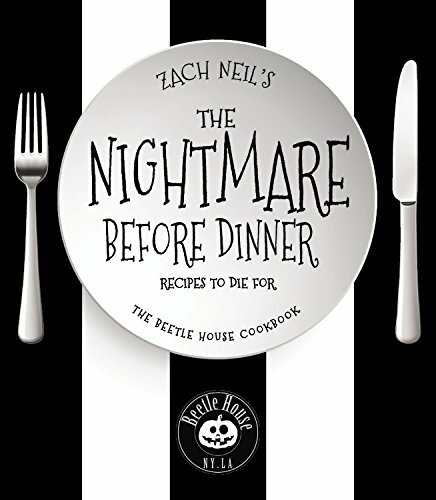 The Nightmare Before Dinner: Recipes to Die For: The Official Beetle House Cookbook is based on the Tim Burton themed "Beetle House" restaurant menu. The bar/restaurant of course can't use Tim Burton or his movie names in their business, so instead they proclaim they pay "tribute through food and drink to all things dark and lovely." There are two Beetle House restaurants, one in New York and one in Los Angeles. I haven't had the pleasure of dining at either, and I really want to! This dark and lovely cookbook is scheduled to be published in September. Besides featuring goth movie themed recipes, the book will offer a section on how to throw a Tim Burton themed party at your house. Add this to your wishlist or pre-order it so you'll have it arrive in time for your 2018 Halloween preparations! Check out Beetle House NYC and Beetle House LA on Instagram. I think the recipe for their Mac & Cheese is on the back of a Kraft box!. Very boring , bland food. Can't imagine a "Recipe Book" for this place.